A second police force has warned hillwalkers not to rely on smartphone apps as their sole navigation tool on the mountains of Scotland. Northern Constabulary echoed earlier comments by Grampian Police who said lives were being put at risk by people venturing on to the high mountains without adequate equipment and the ability to find their way. A spokesperson for Northern Constabulary said: “On two occasions in recent days, both police and Cairngorm Mountain Rescue Team have been involved in the rescue of lost walkers who were relying entirely on apps which proved to be insufficient on their own. “Aviemore Acting Inspector Kevin MacLeod added: “When you consider the dangers of getting lost in the mountains or of taking a false turn, it would be difficult to overstate the importance of being able to navigate accurately. “Smartphone apps are a great innovation but, on their own, they are not reliable enough for navigation in the mountains. Simon Steer, deputy leader of the Cairngorm Mountain Rescue Team said: “Last night alone, we were involved in two separate incidents, involving a total of 16 people, who had relied on smartphone apps to navigate on the high tops, were very poorly equipped for the conditions, and become lost in the Cairngorms. “It’s great that more people are venturing into the hills, but we need to be very aware of the limitations of new technologies and avoid relying solely on them. Yesterday, Chief Inspector Andrew Todd of Grampian Police said lives were at risk when ill prepared walkers ventured on to the mountains. He said: “I have been involved in mountain rescue for nearly 20 years and, while technology can and does play an important part in raising the alarm or assisting navigation, it appears we may be about to witness a marked increase in the complete reliance of smartphone apps to navigate some of the UK’s highest mountains. “What is particularly concerning is that the individuals who are relying on this apparently inappropriate technology often do not possess even rudimentary mountain navigation skills. One of the joys for me in the hills is self-reliance and self-rescue, which is becoming increasingly rare. I pity the MRT's who are called out at all hours to rescue those on the hills who have no right to be there. Insurance for rescue is coming closer to reality. With the advent of GPS systems, people are losing the abiity to read a road map, let alone something from the Ordnance Survey. A sad and sorry state of affairs where the well prepared will end up paying. What many app and smart phone users fail to appreciate is that whilst the phone is using its GPS tracker and associated software, battery life is significanlty reduced and if left on permanenetly will flatten the battery before the proposed walk is completed - I tested one in the Lakes and it died on me after three hours - no contingency plan for a flattened battery leads to no idea where they are. We have simliar problems in the lakes. However, and unfortunately for MRT, there is another technology now legally available to walkers PLBs to alert the authorities via satellite. I do carry a GPS unit for backup but only use it to check a location - battery therefore lasts for months. My waterproof maps and my compass and pacing beads are pretty old but they have never let me down yet. I take my mobile with me on the mountains, but for one use only - to contact the emergency services if I come across a casualty who needs medical help which is beyond basic first aid. It would never occur to me to use it as a form of navigation. I think a lot of people are too reliant on their mobile phones nowadays, without stopping to think what would happen if the batteries die at the most inopportune moment. I frequently go to the hills without GPS, sometimes without compass but never without a map. 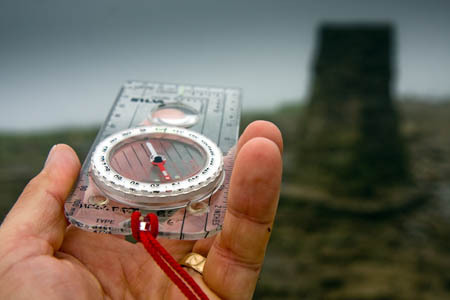 The fundamental skill of relating what you see to what is on a map is essential to safe mountain walking and we need a campaign to educate the new techno users of its importance. The most important equipment to carry on the hills is your ability to find your way over and off the hills safely - without a callout. This article and many other recent ones reinforce the need to get this message across to people who are new to the hills but who come via routes that conventional mountain training misses. The representative bodies need to get together a punchy campaign to promote safe walking in the hills for newcomers.